I brewed Work Burner Barleywine back in November. It was a bit of “garbage” beer as I threw in some malts that needed to purged from the inventory. This beer also was the first one brewed after trying to determine why, at least to my perception, my high gravity home brews were coming across with high alcohol in the aroma/flavor. The beer sat in the basement on a heat pad, connected to a temperature gauge and wrapped in a blanket to keep it at 68 degrees. This process seems to have helped on a taste of the beer out of the barrel. A couple of weeks will be the real test. Removing the bung from the barrel allowed the character of the beer to come out. It smelled fantastic: vanilla, oak, bourbon and molasses headed the sensation. I couldn’t stop quaffing the beer. Racking to a bottling bucket continued the onslaught of the barrel aging on the nose. The beer did drop from 1.016 to 1.014 while in the barrel. The taste, of the flat beer, was dominated by the barrel but didn’t kill my palate with alcohol. Success??? 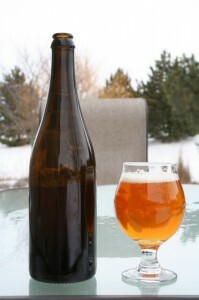 I always use the bottle priming calculator from TastyBrew.com. It would probably easier to look back in my notes but the computer is always on; much easier than paging through the note book. 😉 I used 2.7 ounces of priming sugar in two ups of tap water, boiled for 15 minutes. Because the aroma was so fantastic, I am going to be have a hard time not popping a cap before it is fully carbonated. Now let’s hope it meets my expectations. Enjoy! Useless Fact: A fully loaded supertanker travelling at normal speed takes a least twenty minutes to stop. In my short home brewing career (four years) many beers have come and gone without much fanfare. The last bottle of most beers wasn’t much of of a thought and, in some cases, didn’t come quick enough. Heck, I think I have some bottles of two year old IPA. Why should Brett Backspin be any different? Simply it is my favorite beer that I have ever brewed. I had to pay hommage to the beer as well as compare notes from seven months ago. Look: Not much as changed from the original look of this beer. Worth noting that is it extremely clear. Original notes: Clear accents the golden hue with a pure white lacing that doesn’t have depth or staying power. Lacing is sporadic, mildly dotting the glass throughout. Aroma: Green grape/white wine and pear have become much more dominant; still extremely pleasant. Different from “regular” yeast and so much more rewarding. Original notes: Delicate. Complex. Gentle white wine permeates along with pleasing yet docile pear accent. Laid back grain scents add a backbone to the aroma. Taste: Similar to the nose that both Brett characteristics have picked it up a notch. Amazingly they are still harmonious with each other. Orginal notes: The white wine (green grape but w/ alcohol maybe) greets first, stemming from the nose. Carries throughout the beer. Pear picks it up a notch, creating more of balancing act. Fragile. Grains again show here. Drinkability: Very refreshing, especially in the summer months but a cold winter day didn’t hinder the enjoyment. Dries the palate. Original notes: Light body without a question. Carbonation adds a nice elegance to the beer. One of the few times I have dialed it in well. Overall: This beer was fantastic. I hate that this was my last bottle. So good when young but awesome at this point in time. Going to be brewed again soon. One I need to have a bottle of in the cellar all the time! Original notes: The Brett is there but not as pronounced as I would have liked. But as I continue mull this beer over, maybe that isn’t a bad thing. A delicate, yet complex beer has its place. The body is very light. After hearing an interview with Chad Yakobson, I might have to throw some oats in the next batch to hold up the body. That said, this is one light, easy drinking beer. Useless Fact: The reason firehouses have circular stairways is from the days of yore when the engines were pulled by horses. The horses were stabled on the ground floor and figured out how to walk up straight staircases. You are currently browsing the Sips blog archives for February, 2013.